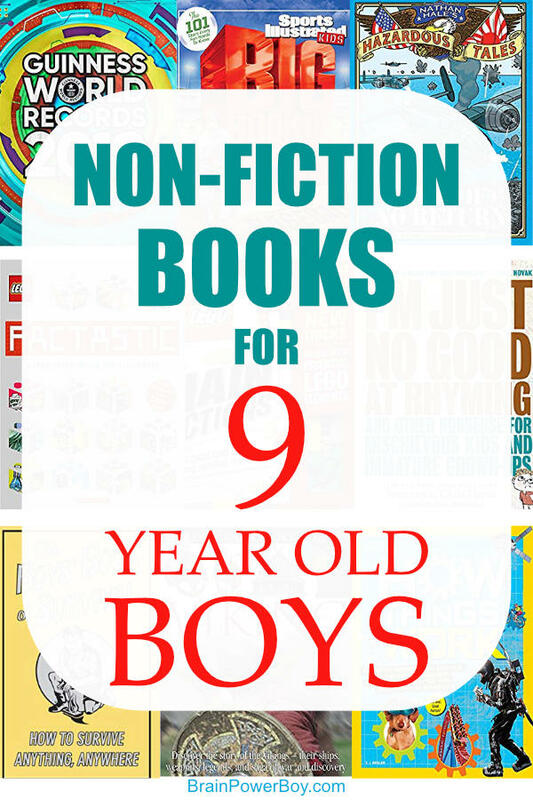 Are you interesting in finding the best books for 9 year old boys? We went through a lot of books to find the ones that will keep their interest and keep them reading book after book! Lets chat about finding the perfect books for your boy. Boys age 9 are probably in 4th grade. The books they read are getting longer and have more characters. There is more to the stories and the plot. As they read the stories are a bit deeper and they have to keep track of what is happening more than they did when they were younger. Some boys, however, are a bit put off by a thicker book. If they are, don’t push them. There are plenty of good books that don’t have a big increase in pages. Or, he may love graphic novels as they include plenty of images to help him move through the stories. When books start to get more complex and longer, we need to keep in mind that we still want them to be very engaging. Letting your boy choose his own books, whether they are above or below his reading level is a great way to keep him reading. Non-fiction is also still a big draw for boys this age. Be sure to see the non-fiction section of this list for suggestions! While most boys are reading on their own at this age, some boys may be struggling, or they may be homeschooled and allowed to read when it comes naturally for them. Take the time to find the books that he will be interested in and bring him to places where they have a lot of books. Libraries, new and used book stores, rummage/yard sales, book sales and other places where both of you can select books to have in your home. Continue to expose them to books and let him read on his own and for you to read to him. Oh! By the way, I have noticed that whenever a child begins to read on their own, the parent slowly stops reading to him. Don’t let that happen! Enjoying books together can be a lifelong endeavor. This list is to help you find books for your boys or the boys in your class. I don’t pick books that parents or teachers want the child to read at this age, this list is for the boys. It is packed with books they will enjoy and get a lot out of. Our goal here on BrainPowerBoy is to raise boys who love to learn and part of that is instilling a love of reading and the joy of finding the perfect book. I hope you enjoy the list and are able to find a lot of good books that lead him to other good books. I am not a reading level mom. I don’t care much about it at all. I know that is contrary to what others do and say and I am fine with that. When choosing a book for my son, I take his interests in a topic and the engagement level of the book in mind, not his age or a level. Just letting you know I don’t use them. At the same time, I am providing a list full of books that 9 year old boys will like. Not every boy is going to like every book. We are all unique! However, this is a great starting point. You will likely want to check out the other by age lists as well because all of them have good books in them and you may well find something he likes there as well. Keep your laser focus on your own boy and what he likes and you will do great selecting books for him to read or to give as a gift. We have one simple, and yet somewhat complicated, task ahead of us and that is to help our boys love books and reading. And now . 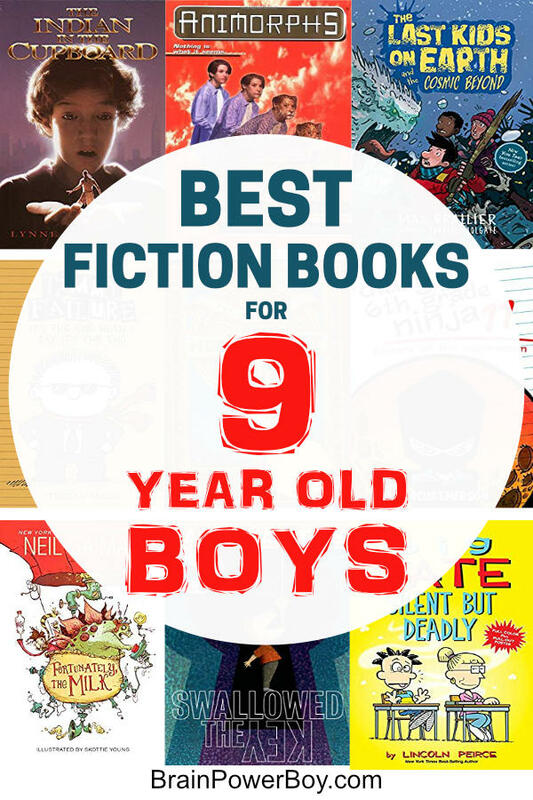 . . let’s see the best books for boys age nine! I always have two parts to my by age book lists for boys. The first is a fiction section, followed by a non-fiction section. Be sure to check out both of them, and ideally make selections from both areas. Scroll the list and read the book descriptions to see which ones stand out as something your reader will like. When Omri turns nine and gets a little plastic Indian for his birthday from a friend. He is not exactly excited by the gift. Enter a metal cupboard and an old skeleton key from his great grandmother and thing get quite a bit more exciting. This is a good book with an unusual adventure twist to it. Boys everywhere have enjoyed this book about Omri and Little Bear. The Animorphs series is filled with stories that are a cross between fantasy and science fiction. In them an event happens, the Animorphs who must keep their identities secret, are caught up in it and have to use their powers to morph into any animal that they touch in order to achieve their end goal. There are enemies, war, leadership, morality and other topics prevalent in the books, some of which are a bit more grown up. These are young adult books which are great to start at around 9 years old. If your boy is sensitive or you are concerned about the topics, you should take a look at a book or select one that has a less intense subject matter. Boys tear through these books which is a great thing indeed. There are 54 books and another 10 companion books as well so that should keep them reading for a long time. Pictured: The Forgotten, #11 in which Tobias finds a Yeerk bug fighter and sets out to prove that earth has been invaded. The Yeerks retaliate by sending the Animorphs to another time. This has been a hit with this age group. It has been described as Diary of a Wimpy meets The Walking Dead. I don’t know that it is Walking Dead level other than the zombies. It is funny, that is a fact. Guys love it – a lot. If your boy is a zombie apocalypse fan this series of books is a must. In The Last Kids on Earth and the Cosmic Beyond, one of the latest books released, it is winter and while they are having fun, things change when a villainess is after something that Jack needs. Watch this clip to get a feel of the style of the books. I thought it may help you decide if you want to try these with your son. It’s The End When I Say It’s The End, actually is the end. And so many were disappointed that the series was over I can tell you that. If your boy has not yet discovered these, you should grab a few for him to try. Obviously starting at book one is a great idea. I’m just sharing the latest one in case someone is already familiar with the series. You wouldn’t want to miss the ending! The Timmy Failure books are mysteries. Funny and pretty crazy and strange mysteries. Timmy is 11 and has a detective agency. He is clueless and a bit odd. Oh, and he has a pet polar bear named Total. << see?! You may know the author Stephen Pastis from the Pearls Before Swine comics. If so, the sense of humor is similar but toned down to be appropriate for a graphic novel. An orphan, clock keeper and a thief young Hugo lives in Paris. A girl who is a book lover and a crabby old man meet the boy and things get complicated as Hugo needs to stay in the shadows. There is much more, much more. This book isn’t a wordless book as there is some text but not a lot. Everyone should give it a try. I’m sure you will enjoy The Invention of Hugo Cabret as well. I know we did. Yes, the book says 6th grade, but honestly I think 4th grade is nice for this one. Kids like to read about those who are a bit older than they are. If he has not read any of these you can start with book one. Or if you need the latest one, get Beware of the Supermoon. Chase Cooper is a boy in the 6th grade who starts at a new school and meets up with a group of ninjas. This is his account of what happens. It is a funny, adventurous and enjoyable book. There is mostly text though there are a few illustrations throughout. I don’t feel the amount of text will be overwhelming for most as it is in short sentences and paragraphs laid out nicely on the page. Many moms said this one got their son reading. Does he love funny? Try this one, for sure! Very, very imaginative. Fortunately, The Milk is a rollicking tale (I’ve always wanted to say that lol.) A father goes to the store for milk and takes a bit long returning and comes up with a rather crazy time-travel story about why it took him so long to get back home. This has a whole lot of positive reviews! It makes a super read-aloud. You will have no trouble finding one of these that he likes. There are so many different titles. In fact, there are over 180! The set above has the first five books. We like the older ones, as we think the writing was better and the adventures were more exciting. That doesn’t mean the later books aren’t good and I’m sure there are those who think the newer ones are better than the old ones – you know how that goes. Each book is an adventure (obviously) and there are choices to be made after a few pages. When you choose you are directed to a specific page to start reading again. What you choose to do lands you in different circumstances. There are also many different endings. Very enjoyable and exciting to read. We usually read through to try most of the various choices after we made it through the book the first time. Go and check out the set or see all of the books and select your own. Joey Pigza Swallowed the Key is a book for all of the misunderstood kids diagnosed with attention deficit disorder or those who know someone who has, or wonder what life might be like, with ADD. Joey is bouncing off the walls. He has a wonderful mom who really loves him. He tries, but he keeps making bad choices. Partly because his medication isn’t working well and partly because he is a boy with a condition and it makes it hard for him to choose the right things. He gets into trouble that ends with him being suspended from school and sent to a special education center. The book was well received when it was written and is still popular today. Note, this is a series though the first book is really the best. If your boy likes the first one, do try the others as some enjoy them a lot. Big Nate Silent But Deadly is one of the latest books in this super popular series. I know a lot of boys who read every single book and can’t wait for the next one to come out. When it does . . . they have to be one of the first to get their hands on it. While checking into the books quite a while back, I found out that they are based on a comic strip that Lincoln Pierce had been drawing for more than 20 years! A bit of trivia there for you I guess. I found it interesting as I thought they were a copy cat type Diary of a Wimpy Kid book but I was totally wrong. The Big Nate books feature Nate who is in 6th grade and his school adventures. He likes junk food, skateboards, plays the drums and chess and thinks he is better at everything than he really is. Overall he is a good kid though and these make for fun and quick reads. They are graphic novels and depending on the book have some text, comic book panels as well as illustrations. Very friendly to guys who are not big readers, comic book fans and any who enjoy a funny book. Magyk and the six other books in this series are great for boys who might find other fantasy books a bit too dark. Harry Potter is, of course, very popular but honestly some younger kids have a hard time with how dark it gets as the books go on. This set of books is just right for nine year old boys. They can start with Magyk and work their way through. There are also companion books to try if he ends up liking these. Born the seventh son of the seventh son, Septimus’ parents believe he has died at birth. They find a baby girl in the snow and take her in. But Septimus has not died. There is magyk afoot. The plot twists and turns. Mystery, fantasy, humor and more will keep your boy interested. While they may figure out what happened to Septimus, that will not take away from the enjoyment of reading this book. James’ parents have died in a tragic accident (rhinoceros!) and he is living with his two despicable aunts who are seriously mean. Then James meets an odd man in the garden and that begins an adventure involving a peach, giant bugs and many more things one couldn’t likely imagine on their own. So, this book with the cover showing a boy with his finger up his nose is not going to be something every mom is going to embrace. However, Oh Yuck! The Encyclopedia of Everything Nasty is packed with interesting and, yes, gross, information. This book is a bit different in that there is a lot of text. Some books have a lot of visual appeal, and while this does have some images, most are cartoon illustrations. It is a great book for boys who are readers, who want to know all the details, and who are fascinated by the disgusting. They can also try: Oh Yikes! Histories Grossest Wackiest Moments and Oh Ick! Science Experiments Guaranteed to Gross You Out. Combined, these three books have sold over a million copies. That should tell you something! Encyclopedia Mythologica: Gods and Heroes is a pop-up book. Believe me when I say that pop-up books are not just for the young. The pop-ups are amazing! There are also flaps that you lift to get smaller pop-outs. Those two things are enough reason to purchase this book, but . . . there is also plenty of wonderful information on myths and legends. This book is a treasure. Robert Sabuda is the master of pop-ups and he did an incredible job here. Guinness World Records 2019 is called “the world’s most popular record book.” I’m sure you have seen these or looked at one before. This year they added in info on the “maker” movement which I think is a fabulous idea as it may well get your boy interested in working with his hands. There is also a section on LEGO. Most of the time there are warnings in the book that say “don’t try this at home” but in this case 2019 adds a “Do Try This At Home” section with five fun activity ideas. If you don’t already have these at home, give one a try. If you have an older copy, I would get this one as well because it has a lot of new stuff in it. Do your boys need to know how to survive an alien invasion, a man eating tiger, or a hungry hippo? Perhaps not, but I bet they will enjoy reading about it. On the other hand, The Boys’ Book of Survival also has things they may need to know such as how to escape tricky situations, gut a fish or survive a school dance. All of those and many, many more are in this entertaining and actually useful book that they are sure to pour through. Less intense than some of the other books of this type, this one is age appropriate and a fun read. There are a lot of fact books out there but this one has a neat twist. If your boy likes LEGO, he is going to enjoy this book. Presented with a whole lot of great facts and information, Factastic, is also filled with minifigs who are there to tell bits and pieces as well as mini stories and add visual appeal. Along with the amazing photography, the minifigs and the general enjoyment of reading a book like this, the topics are boy-friendly with nature, science, history, technology, geography etc. LEGO fans should enjoy it! Have a curious guy in your house? He will like this! How Things Work is digs into how a lot of neat things work. This book features a lot of pictures! An overall good one for checking out the workings of all sorts of different objects from simple things like erasers up to technological feats like a hover bike. Plus there are tales from the lab which feature real scientists & engineers. Who knows, maybe this one will propel your child into a career in one of the fields covered! We have this and a few other Klutz books. It is awesome! LEGO Chain Reactions is a combination of a LEGO building book and a kit. He can build moving machines and believe me if he is a LEGO fan, he will want to have the pieces included with the book. Not only does it give directions, but with what is learned here one can take that info and build their own creations as well. You will need other LEGO bricks to go with the book as they are including specialty pieces needed but not every brick you need. If he has a decent amount he likely has everything needed or can substitute a piece or two and make it all work. Need More LEGO Book Ideas? Try Our Best LEGO Books List! Oh my! What a treat. I like funny poetry books and this one is a winner. In fact it is a real winner as it has won a whole lot of awards! Funny poetry is the very best way I know to get boys to read poetry at all. Sure, some are going to love poetry of all types but others will shun it as soon as you say the word. In that case, you have to meet them where they are. I’m Just No Good at Rhyming is not going to suddenly get your child reading Whitman, but if you can show them that reading poems is enjoyable, perhaps it will . . . someday. Having good encyclopedias and dictionaries in the house is essential. I am adding this type of book to all of my lists because not only are they important to have at home but because they are non-fiction they actually enjoy looking at them. In this case, I have chosen the DK Children’s Illustrated Thesaurus. It is packed with 4000 entries that are friendly for younger kids (as opposed to the one I have in my office that is all very tiny text) and over 36,000 synonyms. Not only is this helpful for writing papers or other work they need to do but it is great for learning and playing around with words. Helping your son have a rich vocabulary is only going to help him throughout his lifetime. These National Geographic Sports books are all about the players. 101 players to be exact. These books come in Baseball, Football and Basketball versions. I chose Eyewitness Viking to feature but all the Eyewitness books are good. I have used these books in our homeschool, but even if we were not using them, I would still purchase them for my son. They are so good. My favorite things about them is the amount of solid info they pack into them, as well as they layout and format of the books. They use a two-page spread and cover a topic in a very appealing way with large items sometimes flowing over onto to pages. There are multiple pictures to look at on each spread and next to the items there is interesting factual information. Key point on interesting. You can see all of the Eyewitness books here in case Vikings are not your son’s thing. (Although, this book is really, really good 🙂 ) There are several pages worth of titles on Amazon in a big variety of topics. He tells it like it was. So do be aware of that before you choose these books. This is a series of graphic historical non-fiction which I am super happy was written. You are likely familiar with graphic novels but with graphic non-fiction we go into the true stories and events. I am a big fan. We have read several different series in this newer genre and have been happy with some of them. This is one that I can easily recommend. In Raid of No Return the topic is World War II and the event is the Doolittle Raid. 16 plans plan to fly and bomb targets over Japan. As I said earlier, he is detailed. He does not sugar coat things. Yet, the books are very engaging and appealing. Plus, lets face it usually boys can handle the facts a bit better than moms. At least that is the case on my end. 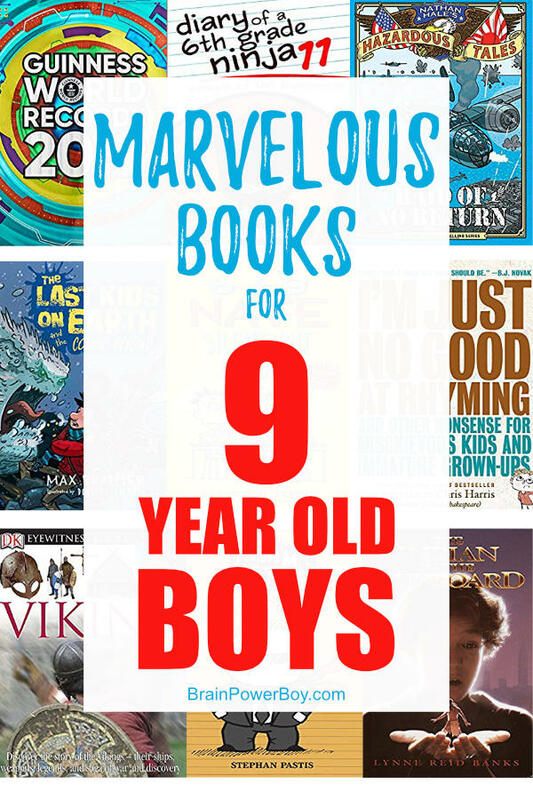 Looking for the best books for 9 year old boys can be a bit tough, thankfully you have this list to go through. I hope you find a great bunch of books for him to read! Try our best books for 8 year old boys as well. There are good books that he will enjoy. Thank you for the inspiring list of boy books!!!!! I just requested so many from our library! You are most welcome! I’m so happy to hear you like the list. I hope you found some good ones and the person you are ordering for enjoys them.